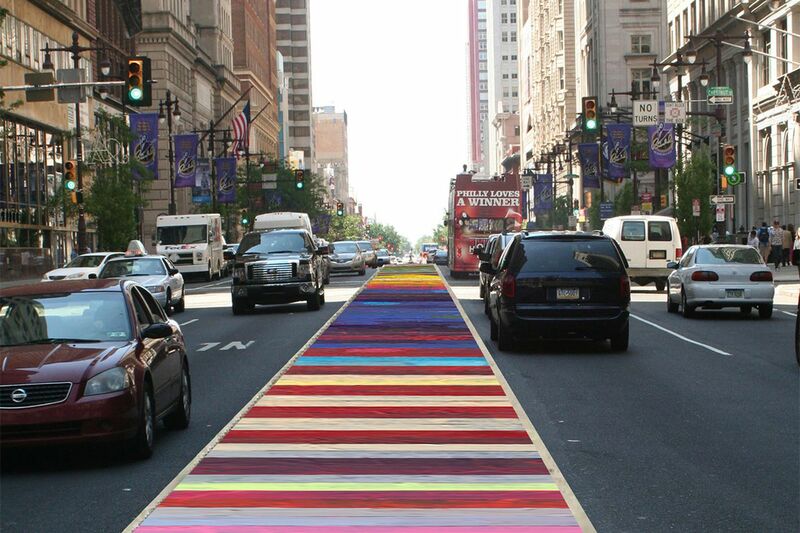 A mile-long, multi-colored mural will carpet the middle of South Broad Street for the Democratic National Convention. The flags along the Benjamin Franklin Parkway have started to fray. The sidewalks around the Convention Center are showing cracks. And Center City construction sites block sidewalks along main pedestrian routes. A little more than a month out from the July 25-28 Democratic National Convention, it's time to tidy up. With that in mind, the convention's host committee over the last few months has deployed a crew of volunteers to canvass the areas around the Convention Center and the Wells Fargo Center. Now the face-lifts and art projects are underway. "This is a very walkable city, and we want the convention attendees to feel that way, too, to feel welcomed, see those banners, and really showcase Philadelphia the best way we can," said Jennifer Nagle, vice president of business development for the Independence Visitor Center and a volunteer with the host committee. Some improvements are being paid for by the host committee, others come out of city department budgets, city spokeswoman Lauren Hitt said. Hitt said she could not provide an exact figure for the city's share until later this week. Lighting along the Avenue of the Arts, Boathouse Row, and the south side of City Hall, along with a courtyard light installation. Decorating City Hall with patriotic banners and bunting. Several new bus shelters and fresh paint on remaining shelters on South Broad Street in Center City. Removal of graffiti and abandoned newspaper boxes, pothole repairs, and intersection improvements. Replacing state flags on South Broad Street. Replacing national flags on the Benjamin Franklin Parkway. The city has received requests to add flags - like the Cuban flag - but Hitt said it's unlikely any banners will be added ahead of the convention. "It's not as simple as just putting up another flag. There's a limited number of spaces," she said. The city is also requiring that construction sites be cleaned and all sidewalks be open. The Center City District will increase street cleanings and add more than 200 signs to help visitors navigate around. The Philadelphia Parking Authority is renovating the area around its Fifth Street parking garage in Old City to ease pedestrian travel around the National Constitution Center. Art projects also are underway, funded by the John S. and James L. Knight Foundation and the Jody McNeil Trust. "When we made our bid to host the Democratic National Convention, we promised the people of Philadelphia that we would leave some good things behind," said former Gov. Ed Rendell, who is serving as the host committee chair. The Mural Arts Program will carpet the South Broad Street median from City Hall to Washington Avenue with a colorful mile-long mural. The mural, 14 Movements: A Symphony in Color and Words, was created by local mural artist Mat Tomezscko, and will include segments of color and selections of poetry. The Pennsylvania Horticultural Society will place 52 large planters around Center City, and renovate Reyburn Plaza on the west side of North Broad Street. The planting will be done by volunteers from the group's program that teaches former inmates horticultural skills. The art and improvement projects are modest compared with ideas tossed around ahead of the Republican convention in 2000. Developers then promised to build a $168 million shopping and retail space at Eighth and Market Streets, and officials vowed to refurbish SEPTA's City Hall subway station. Neither happened. The most successful beautification effort occurred in New Jersey, along the Admiral Wilson Boulevard, where the two-mile strip leading to the Ben Franklin Bridge received a massive makeover. Staff writer Jane M. Von Bergen contributed to this article.